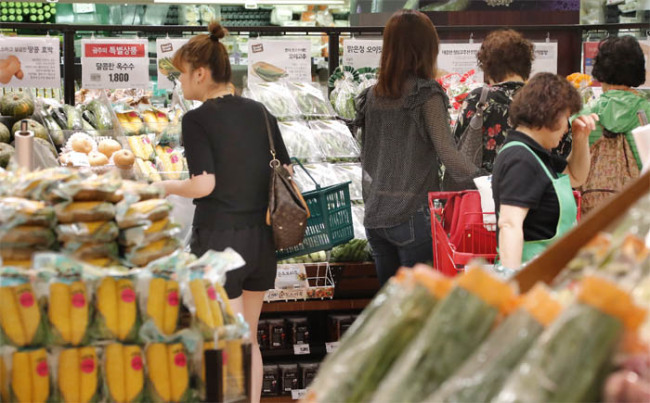 South Korea's consumer prices remain unstable ahead of the Chuseok holiday due to soaring vegetable prices stemming from weeks of hot weather and the recent downpours, data showed Tuesday. The prices of 21 vegetables had increased 4.1 percent as of Aug. 31 compared with a week earlier, according to the Korean Consumer Agency's price chart. Of the total, the cost of 15 items gained over the cited period as an unprecedented heat wave damaged crops and caused diseases in leafy vegetables, while six went down. The price of green onions spiked 23.7 percent, the biggest gain of all, followed by squash with 18.2 percent, radishes with 14.4 percent, ginger with 11.4 percent and Chinese cabbage with 9.9 percent. Fish prices checked by the agency climbed 0.6 percent compared with a week earlier, according to the data. In a bid to counter soaring food prices, the government has said it will increase the supply of farm and fishery produce from its stockpiles ahead of Chuseok, the autumn harvest celebration that usually fuels demand. Chuseok is the Korean equivalent of Thanksgiving Day and is one of the country's biggest traditional holidays, along with Lunar New Year's Day. This year's Chuseok falls on Sept. 24.